First in an eight-part series. Peter Guza jolted awake when the phone rang. It was the start of his junior year at Lehigh University. His first class wasn’t until 10 a.m., and the 20-year-old engineering major was sleeping in. As he looked around his tiny frat house bedroom, the shade drawn against the morning sun, he wondered: Who would be calling before 9 a.m.? It was an old friend in New York, urging him to turn on the television. The caller knew what all of Guza’s old friends knew: His father, Phil, a 54-year-old mathematician for Aon Corp., worked in the South Tower of the World Trade Center. Downstairs, in a room he rarely visited, a half-dozen of his Beta Theta Pi fraternity brothers had gathered around the TV set. Sitting there beside them at 9:03 a.m., with empty beer cans on the coffee table, Peter Guza watched the second plane hit the South Tower. His heart dropped. But then, as he studied the point of the impact, he felt certain it was well below the 105th floor where his father worked. People in the hallway murmured in low voices, spreading the news about his personal connection. More students pressed into the room. Guza reassured his friends; his father was probably fine. The minutes ticked by; it was almost 10. Then, inside a column of black smoke, the building lurched. Guza watched in silence as his father’s tower fell. It was the end of one story, and the start of another. Thousands of families suffered devastating losses on Sept. 11, 2001. In Boston, the names of 209 victims with ties to Massachusetts are inscribed on a memorial in the Public Garden. Of those, 92 lived here when they died. They were the parents of more than 40 children. After the tower collapsed, sending roiling plumes of ash and dust aloft, Guza sat stunned in his college fraternity house. A Beta Theta Pi brother he wasn’t especially close with pushed his way across the crowded room and hugged him. A friend drove him home to Fair Haven, N.J., two hours away, the next day. That night, still hopeful that his father could be alive in a hospital somewhere, Peter, his mother, and brother made a flier with Phil’s picture on it. The clerk at the print shop didn’t charge them to make copies. Later, Peter and his family would speak with colleagues who had talked to his father at work that morning. Aon Corp., a Chicago-based insurance brokerage, had 1,100 employees in the South Tower: 176 were killed. The company also had an office in Boston, where Peter’s brother, Tom, worked. Phil Guza was a brilliant man, a MENSA member with a PhD from Princeton. He was also eccentric and stubborn; he paid no mind to trends and hated wasting time. To his family, the fact that he had stayed in his office was more than believable. It felt inevitable. It was not the first time the family had sustained a sudden, inexplicable loss. Nine years earlier, when Peter was 11, his brother Dave had committed suicide. Dave was 19, the oldest of Phil’s three sons. A freshman at the University of New Hampshire, he was a talented cyclist who planned to be an engineer. He had been treated for depression, but the illness proved too much. After his son’s death in 1992, Phil Guza changed, Peter says. He reconnected with his own brother, after years of distance, and forged a close relationship. His relationship with his two surviving sons, always close, became even more important. Looking back after Phil was gone, family members saw the decade as a gift. The loss of his brother strengthened their family, says Peter; it helped them see their own resilience, and in a strange way, prepared them for the loss ahead. From the beginning, Peter felt little anger. He understood that he had lost his father much too soon, but instead of being bitter, he felt grateful for the time they had together. His parents had divorced when he was only 3, but his father had moved to stay close to his boys, quietly accepting the long commute to Manhattan from the Jersey shore. His father had no interest in sports, but every winter he took Peter snowboarding, on trips to Utah, Colorado, and Alaska, because it was what his youngest child loved most. “He would sign me up for lessons, he would go tour the historical sites, and we would meet for lunch,’’ Peter recalls. When he graduated from Lehigh in 2004, with bachelor’s and master’s degrees in engineering, Peter knew he didn’t want to live in New York City. Too many people; not enough mountains, he says. Because of the 9/11 settlement money he had received, he had the freedom to “roll the dice,’’ as he puts it, and move where he wanted before looking for a job. His brother Tom was in Boston, and he moved here, too, buying a multifamily home in Arlington. Together, the brothers also bought 90 acres of land in New Hampshire, with visions of a rural retreat where their families would meet every summer. That same fall, Peter met his future wife, Shalan, a Cambridge native and ardent Red Sox fan, who introduced him to the joys of baseball as the Red Sox made their storied run to the World Series. They married in 2007, and their son, Owen, was born last year. His birth has made Peter, now 30 and working at a Burlington biotech firm, feel both closer to and more distant from his father: in some ways he understands his father’s life better now, but his new responsibilities have also underscored time’s passage. He smiles when he talks about his father: Phil’s “dungarees’’ and ever-present suspenders; his love of bowling; his pride in Peter going to Lehigh, his alma mater. Last year, soon after Owen was born, Peter finally got around to doing something he has thought about for years, establishing a nonprofit organization, the Phil Guza Memorial Scholarship, to give college money to aspiring math and science majors. The hardest thing to accept, he says, is that his father’s remains were never found. On a trip home to New Jersey this summer, he took his son to the Monmouth County memorial where Phil Guza’s name and hometown are inscribed. A sculpture at the site shows an eagle flying away from Manhattan, gripping a twisted piece of steel in its claws. The bent metal was recovered from ground zero. His brother Tom left Boston a few years back, for Arizona; the land they bought together in New Hampshire is for sale. In past years, Tom has always golfed on Sept. 11, avoiding TV and chatter about the anniversary, while Peter has usually attended a remembrance ceremony. This year, though, the brothers and their families will meet in New York City to attend the program there. Tom has a 1-year-old son, too, and they know that as time passes, it will be harder and harder for both of them to make the trip. They work all the time, seven days a week, as they knew they would when they bought a cafe on Newbury Street. It was not long after 9/11 then, and Ysuff and Haleema Salie wanted to be busy, to lose themselves in the steady rhythm of business, pushing past the quiet hours where ghosts can lie in wait. When they face decisions - how to market the business, what kind of place it should be - they often ask themselves, what would Rahma say? Their daughter was only 28 when she died, but she had been their most trusted adviser, an ambitious, energetic Wellesley graduate and businesswoman. Her passion, despite the demands of her own fast-advancing career, was to help her friends and family succeed. Rahma Salie was endlessly outgoing, a connector of people and ideas. The middle child, the older girl, she was the one who looked after her parents, who called them almost every day and came to Sunday dinner. She had a million friends and a husband who adored her, Michael “Micky’’ Theodoridis, 32. Three years into their marriage, she was seven months pregnant. On the morning of Sept. 11, 2001, Rahma and Micky boarded American Airlines Flight 11 to California. The trip, to a friend’s wedding, would have been their last before their baby was born. The Salies are a close-knit Muslim family, with relatives on several continents. Ysuff, 65, is Sri Lankan, from a family with a long history in the gemstone business; Haleema, 59, is Sri Lankan and Japanese. They raised their children all over the world, in Sri Lanka, Japan, and the United States. Rahma went to high school in Japan, but soon after she moved to Boston for college, her parents and younger sister Farah followed her here. For all of Rahma’s sparkle, drive and intelligence - her mother remembers her arguing with a teacher who gave her an A- when she was 7 - it was not a certainty that she would go to college. In keeping with their cultural traditions, young women in Sri Lankan Muslim families did not always go away to school. Her father recognized her potential, though, and told her if she got into the best schools, she could go. She blazed a trail for her younger female cousins, said her brother; they all went to college after she did. At Wellesley, Rahma studied economics, wrote her senior thesis in Japanese (a first at the college), and worked in the president’s office. Later, at her memorial service, Wellesley president Diana Chapman Walsh would describe Rahma’s radiance, the way she was “everyone’s friend, and our secret favorite.’’ Her boss at Cambridge Technology Group spoke of her adoringly as “a leader you wanted to follow.’’ She traveled 200,000 miles and met with 25,000 executives in her six years with the company, but busy as she was, she always found a way to stretch a trip to visit family: a weekend with her grandmother in Japan; a few days with her brother and his children in Sri Lanka. In the midst of the terrible chaos, there were especially terrible moments. When Ysuff Salie went to the airport sometime on Sept. 11 or 12, desperate for information, he remembers being pushed into a corner and questioned by federal agents, who wanted to know whether his daughter was part of the terrorist plot. The experience was upsetting, but the Salies say the mistake was quickly corrected. More important, in their view, is the hard work the government has done to stop terrorism in the decade since. Afkham Salie, who was living in Sri Lanka at the time, spent days that September packing up the contents of his sister and brother-in-law’s condominium, on West Canton Street in the South End. Their photographs alone filled five huge boxes; 10 years later, he still hasn’t sorted through them all. Rahma’s parents kept her dishes - a simple yet elegant white set that they use daily. Afkham, 42, moved to Boston in 2007 to help his parents run the business, Cafe L’Aroma, and to ease their worry about him living in Sri Lanka in the midst of civil war. On a recent evening at the cafe on Newbury Street, rain drove patrons indoors from the sidewalk seating. The clatter of white teacups and the buzz of conversation in several languages filled the cozy, yellow room; steam began to bead the big front window. From a framed photo on a corner shelf above the cream and sugar, Rahma and Micky beamed. It was, one felt instinctively, a scene they would have liked. Ysuff and Haleema take some comfort from the fact that their daughter and her husband died together. “I can’t think of one thing she wanted to do without Micky, or that he wanted to do without her,’’ Ysuff said at the couple’s memorial service. Still, a decade later, their deaths seem not quite real. “To me sometimes it feels like it didn’t happen, because it happened so fast,’’ says Ysuff. Sitting beside him, his wife pauses, then agrees. “She just disappeared,’’ says Haleema. She remembers when she started making lists. Only a few hours had passed since the planes hit the towers. Her mother was gone - she knew that - and Stephanie Holland was changing her 3-month-old daughter’s diaper. She looked around the house and had a realization: “People are going to be coming over, and I need to vacuum.’’ Just like that, she was transported - out of the sprawling mess that threatened to take her down with it, into a simpler place where chaos could be dealt with. Now, Stephanie was taking care of people: her own children; her younger brother and sister, who were just 18 and 22; and her father, who had always played a supporting role in the household, and couldn’t find the sheets to make up the beds when relatives streamed into town to help mourn Cora’s death. She had always been a good daughter, fulfilling the expectations of her family and the affluent suburb where she grew up. She married her high school sweetheart. She became a teacher, but quit working after her second child was born to be a stay-at-home mom like her mother had been. But under the surface, after her mother was killed, something shifted. And as Stephanie emerged from her long withdrawal, she began to feel a sense of urgency. The brevity of life, the chance that it could be cut short, seemed to demand that she start living differently, more honestly. It was an electrifying idea, but it was terrifying, because she could see where it would lead: to the end of her marriage, after 15 years. They had been together since their junior prom in high school. Their relationship had never been fraught with conflict, but it was not, she felt with growing certainty, the fulfilling union that a marriage should be. She had realized, without her mother there to nurture her, that she wasn’t being nurtured as she needed. In the early years after 9/11, Stephanie had found solace in long-distance running: being alone with her music, proving her endurance. She had lost 70 pounds and run three Boston Marathons in memory of her mother, finishing the first one in 2007 with a sprained ankle. But she knew that this would be much harder. She had always done what was expected, and made other people happy. Now she was going to cause her family pain. Finally, one night last year, Stephanie summoned her courage. The next day, the couple and their children were leaving on a family vacation to Jamaica. As always, the prospect of flying had triggered complex emotions. “What if something happens,’’ Stephanie thought, “and I never did it?’’ She feared that if she didn’t act then, she never would. After their divorce, she moved to Framingham, to a leafy street a short drive from their old house in Wayland, where her ex-husband still lives. They share custody of their two children, Drew and Amelia, now 12 and 10, who spend half of each week at each house. Now that her children are older, there are harder questions to answer. When Osama bin Laden was killed, Drew wanted to know if it was wrong to celebrate someone’s death. Drew talks about joining the military someday, to defend the country and protect his mother. Stephanie believes his ambition stems from his grandmother’s death. “The hardest thing, for me, is for my children not to have her,’’ she said. She spent the first part of the summer dreading her 40th birthday in August, not so much because of the personal milestone, but because of the season her birthday ushers in. Every year as September approaches, she wakes with dread in her chest, knowing what’s coming, but powerless to stop it. Last month, three days before her birthday, she sat before her laptop researching master’s degree programs. She is contemplating a new career as a counselor, inspired by her work with Metco students in Sudbury. Maybe, she thinks, she will specialize in grief. Part of her thinks it’s a crazy idea at her age. The other part thinks she has no time to waste. Her mother, after all, was enrolled at Cambridge College when she died, working to finish her college degree in her 50s. “There are people who say, ‘You want to be happy? What’s that?’ But you only have one life, and you’d better be happy,’’ she said. She is proudest of her small accomplishments: her children’s willingness to talk to her about anything; the way she has learned to be OK with quiet time, and stillness. But she considers herself a work in progress. After it happened - almost right away - Andrea LeBlanc started feeling out of step. Watching the country’s reaction, the appetite for revenge, she began to wonder why she wasn’t angry. She realized she felt despair instead. The morning she lost Bob, she was in their brand-new kitchen. It was big and airy, 20 by 30 feet, flooded with sun from a half-dozen skylights. They had just finished building it, in March 2001, and Bob LeBlanc was still getting used to all that space. For decades - since 1973, when they moved into their house in Lee, N.H., the day after they were married - Bob had cooked in a cramped galley kitchen, tripping over kids and dogs and milling dinner guests. That September day, their handyman was outside, listening to the radio as he built a new deck on the kitchen. When the news broke, he came inside. It took some time to be certain it was Bob’s plane, United Airlines Flight 175, but when she knew for sure, she remembers what it felt like. “It was like shutters slamming shut,’’ she says, sitting in the same sunlit kitchen 10 years later. They met when he was 40 and she was 27. Both had young children; both their marriages had just ended. Bob was a cultural geographer at the University of New Hampshire. To Andrea, a veterinarian with a 5-month-old baby and a 2-year-old, he seemed impossibly worldly and well-traveled. His personality was instantly engaging, happy, enthusiastic, insatiably curious. At 12, he left his mother a note: “Gone to see the ocean.’’ And he had, pedaling the 50 miles from Nashua on his bicycle. His father had died before he was 1, and so he became self-sufficient. He delivered milk, flowers, and telegrams to bolster the household income; he learned to cook. Later, he cooked for Andrea and their children, clipping recipes, recreating dishes he had eaten on his travels. In their new kitchen, the wide island was supposed to keep visitors out of his way, but it didn’t quite work as planned. Instead of staying on their stools at the counter, the guests kept creeping forward, closer to Bob and his easy way, closer to Bob and his warmth. At first, she withdrew. She didn’t want to talk about it, or take drugs, or see a therapist. She stopped going to her local grocery store, to avoid the tearful questions, the burden of reassuring others that she was OK.
Then, at the end of 2002, she heard about a group called September 11th Families for Peaceful Tomorrows, started by a handful of relatives of 9/11 victims to advocate for nonviolence. As soon as she met them, Andrea felt relief; with them, she didn’t have to explain her feelings. In February 2003, just before the war began in Iraq, she attended her first protest march, in Washington, D.C. Since then, she has traveled the world as a peace activist. In 2005, she helped organize a 385-mile peace walk in Japan, where people in their 70s and 80s, survivors of the atomic bombs that fell in Hiroshima and Nagasaki, wept and shared their stories after 60 years of silence. In 2006, she took part in an international conference on nonviolence in New York where participants included a priest who lost both hands to a letter bomb while fighting apartheid and a woman who befriended the IRA bomber who killed her father. The woman, Jo Berry, has become a friend. She testified for the defense at the 2006 sentencing of Zacarias Moussaoui, the convicted 9/11 co-conspirator who received a life sentence instead of the death penalty. Her goal, she says, is to show her grandchildren they have choices. Her activism has given her another family, and a new purpose - she sold her veterinary practice in 2005 to give herself more time pursue it - but it can’t replace what she lost 10 years ago. The house is still too quiet; Bob always played classical music, loudly, and banged his pots and pans. It has been even quieter lately, since her beloved border terrier died in mid-August. She and Bob picked out the dog together in August 2001, when she was two days old, and Andrea took her home in October, after he was killed. The day before he died, driving home from a visit to one of their children, Bob told Andrea he had a 10-year plan for travel to developing countries, the places he wanted to see before he was too old to get there. He was saving the United States for later, he said, when he would need easier journeys. Globe correspondent Alexander C. Kaufman contributed to this report. Jenna Russell can be reached at jrussell@globe.com. 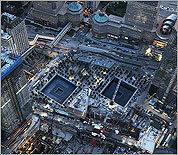 of Ground Zero in N.Y.
Do you feel safer after 9/11? After 10 years of war, security in Afghanistan remains elusive.